One Big Happy Family | to be or not to be? Well… For those curious people out there… I’m not a LB member, upline, downline what-so-ever. I’m just somebody who got disgusted by LB people who ask university students to join such over-price MLM scheme which is so irresponsible, and yes, immoral. For which university you might wonder, I guess you just have to read more to know which university I’m referring to. Still not satisfite? Follow the Anti-LB threat in LowYat.net, or Hong Kong Anti-LB MSN Group. Silly you, if you think you can be millionaire with LB. Don’t worry, I’ll be first. 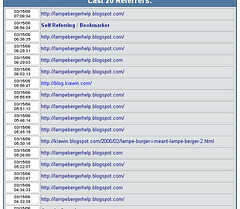 Btw, stop flocking into my blog. Thank you.